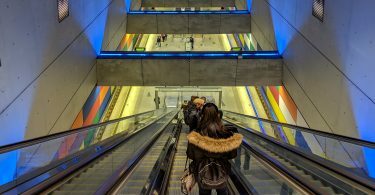 If you’re arriving at the airport during the day, you have a few options to get to Budapest’s city center by public transit. If you’re buying a Travelcard at the airport, you can use the 200E bus to get into Budapest. This bus runs very frequently and can be found directly outside the arrivals section of the airport. Simply hop on and enjoy the journey through the suburbs of the city. The 200E bus will stop at the Kőbánya-Kispest station. At this point, follow signs to the M3 metro line and continue traveling until you reach your stop in the center of Budapest. 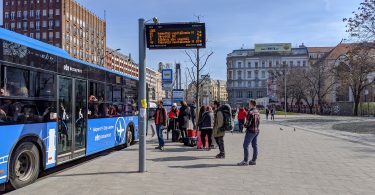 If you’re just arriving in Budapest via the 200E bus, Kálvin tér or Deák Ferenc tér are two popular spots to begin exploring or transfer to metros, buses, and trolleys. This option runs from 5:00 AM to 1:20 AM, and it took us about 40 minutes to reach the heart of the city. There is also the option for a direct shuttle bus from the airport. This bus is the 100E line, and will require a separate ticket costing 900 HUF ($3.20)- the Travelcard is not valid on this bus. Three of the commonly used city-center stops are Kálvin tér, Astoria, and Deák Ferenc tér. These stops all are within the heart of the city and have multiple options for transfers to other metros, buses, or trolleys. This option runs from 5:00 AM to 1:20 AM. It will take about 30 minutes to reach the city center. There is also the option of taking the train instead of traveling by bus. The Travelpass covers this journey. 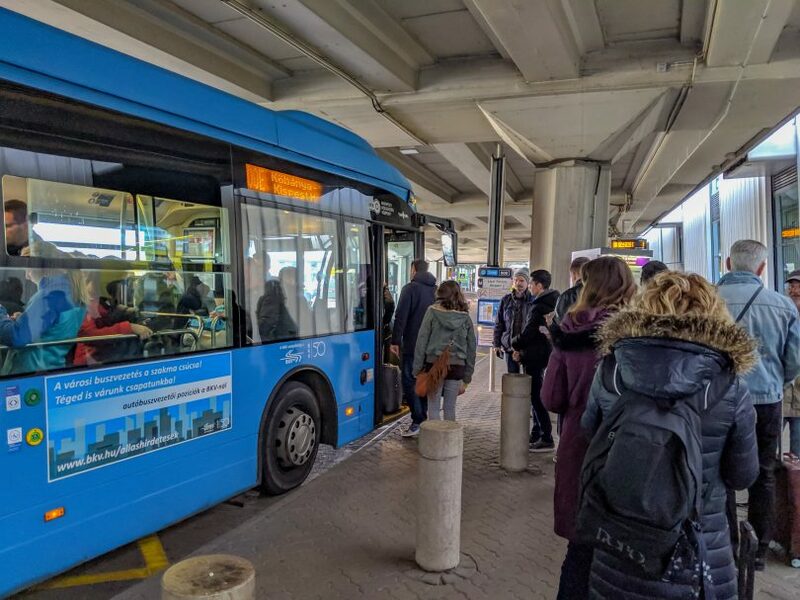 To catch the train, you will need to first board the 200E bus, and after several stops (around 5-10 minutes), disembark at the Ferihegy bus station. 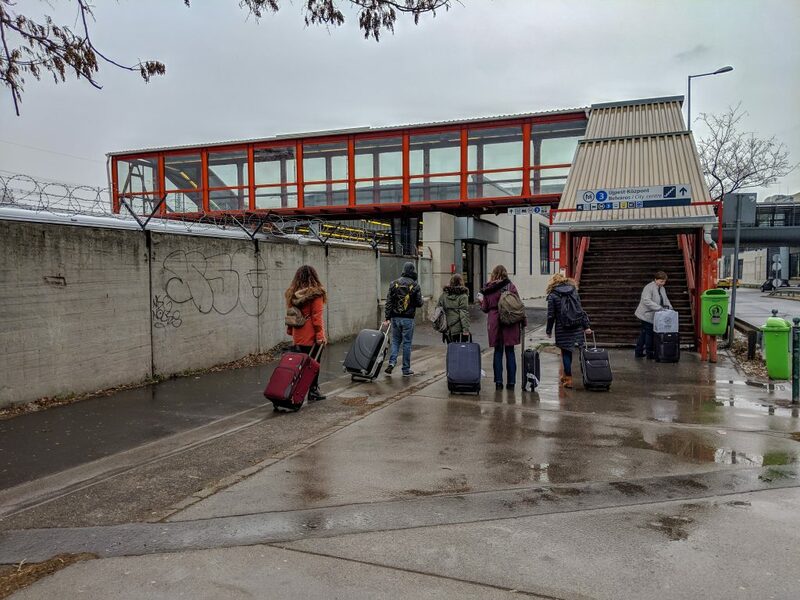 There is a pedestrian bridge that takes you to the train platform. Follow the signs to board the train going towards Budapest Centrum. This train will take you to Nyugati Station in central Budapest. After doing these trips ourselves, we can safely say that taking the bus is simple. The 200E bus is included in the price of the Travelpass, but you do have to transfer to a metro line halfway through the journey. If you wish to avoid the hassle of a transfer, the 100E direct line is not very expensive, but you will have to purchase a separate ticket. If you are arriving at the airport between 1:20 AM and 5:00 AM, you have limited options for night transportation. You can use a taxi service, or save money by using the 200E bus. However, during night hours, the 200E bus will stop at the Határ út station and you will need to transfer to a night bus. Night buses in Budapest are numbered in the 900s. The lines that will get you to Deák Ferenc tér are 914, 914A, 950, and 950A.